Providence is Quinn's fascinating memoir of his life-long spiritual voyage. His journey takes him from a childhood dream in Omaha setting him on a search for fulfillment, to his time as a postulant in the Trappist order under the guidance of eminent theologian Thomas Merton. Later, his quest took him through the deep self-discovery of psychoanalysis, through a failed marriage during the turbulent and exciting 60s, to finding fulfillment with his wife Rennie and a career as a writer. In Providence Quinn also details his rejection of organized religion and his personal rediscovery of what he says is humankind's first and only universal religion, the theology that forms the basis for Ishmael. Providence is an insightful book that address issues of education, psychology, religion, science, marriage, and self-understanding, and will give insight to anyone who has ever struggled to forge and enact a personal spirituality. "Wonderfully earnest and engaging. Think of Robert Persig in Zen and the Art of Motorcycle Maintenance or B.F. Skinner in Walden Two." "A thoughtful, fearlessly low-key novel about the role of our species on the planet"
laid out for us with an originality and an clarity that few would deny." engaged with fundamental life-and-death concerns." Daniel Quinn's novel Ishmael is one of today's most beloved novels of spiritual adventure. Winner of the half-million dollar Turner Tomorrow Award, the book has become a backlist bestseller and garnered rave reviews. "From now on," wrote Jim Britell in the Whole Earth Review, "I will divide the books I have read into two categories--the ones I read before Ishmael and those read after." Thousands of readers have responded to this unique and captivating story of a man who enters into a dialogue with a full-grown gorilla about humanity's place in nature. 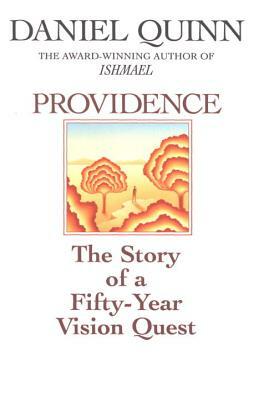 Now Daniel Quinn follows Ishmael with another story of a spiritual quest--this time his own--in PROVIDENCE: The Story of a Fifty-Year Vision Quest.